…that’s right! 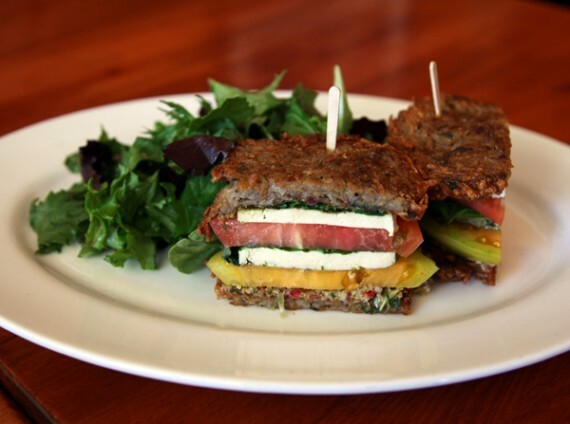 the vegan tofu caprese potato pancake sandwich is comin’ back for the holidays! the special will make its 2011 hugo’s debut wednesday 11/2 at the studio city location, thursday 11/3 in weho, and wednesday november 16th in agoura hills. we’ve blogged about this sandwich before, and it’s ridiculously good. 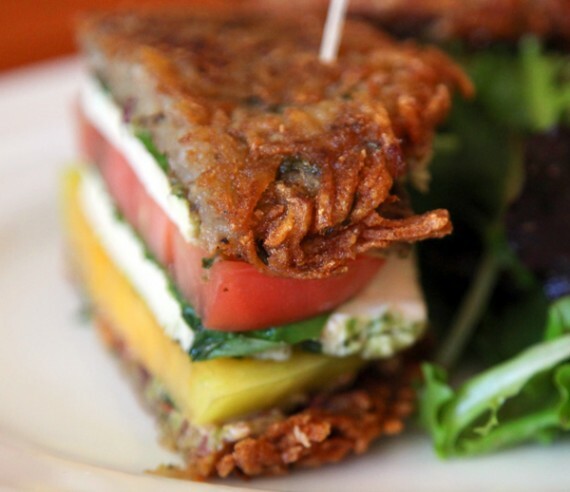 it’s a double decker stacked with firm tofu, heirloom tomatoes, and fresh basil all sandwiched between thick fried potato pancakes. this time around, hugo’s is also adding the option of gluten-free flatbread. i think i’ll stick with the fried potato. anyways, go check it out…and be sure to specify you want it vegan. check out hugo’s website for hours and locations. UPDATED: meatball sub this weekend WEEK only at native foods! UPDATED: this special is so awesome, it will now run through sunday february 6th! eat up! vegan meatball sub available this weekend only at native foods! 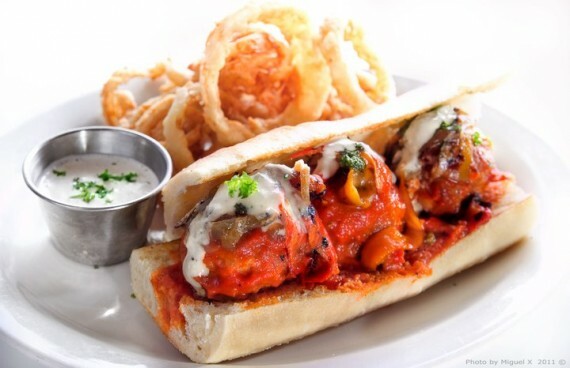 Italian sausage meatballs, marinara sauce, caramelized onions, roasted sweet peppers, pumpkin seed pesto, roasted garlic crema and homemade parmesan on a warm grilled baguette, served with an onion ring pileup. Ranch dressing on the sideline! i am always a huge fan of the monthly specials at hugo’s restaurant, and this month is no different. you must (MUST!) 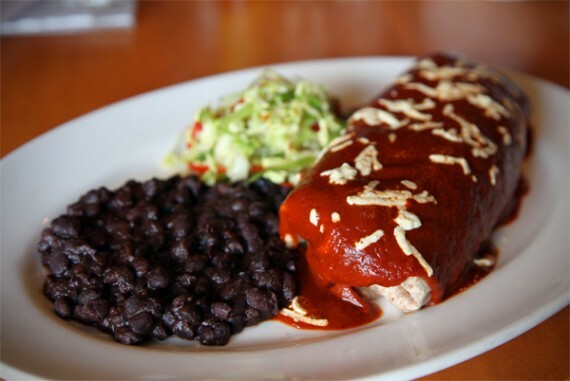 get over there and try out the roasted vegetable enchilada burrito before january ends. first off, this thing is a beast. it’s huge and stuffed with so much good stuff, you won’t be able to eat it one sitting. oh gee, i’m just so chuffed about this! 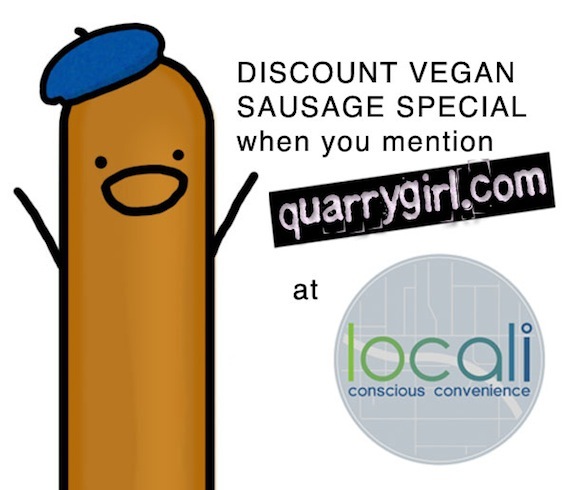 the 2010 discount on the best vegan reuben in town was so popular, that locali has decided to offer another deal to quarrygirl readers throughout this week (or until supplies run out)! this time it’s on their brand new mouthwatering vegan sausage special! vegan south of the border casserole at hugo’s! i am in love with the december specials at hugo’s restaurant, and the best one i’ve tried yet is the south of the border casserole. new sandwich and desserts at native foods tomorrow! hey everyone! tuesday and wednesday of this week, native foods is kicking off “native days,” their monthly celebration of the environment, animals, and food. to get you in the mood to party, they’ve got a new special holiday entree called the turkey loves rye sandwich, available exclusively for native days (this tuesday and wednesday only!). 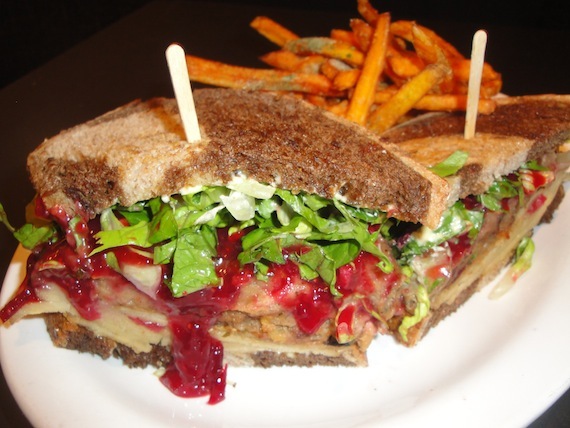 you better go eat this thing, because it sounds insane: thinly sliced seitan, stuffing, cranberry sauce, lettuce and dijon mayo on marble rye with mushroom gravy. it’s a crime that it will only be offered for two days! new menu item at mandoline grill! 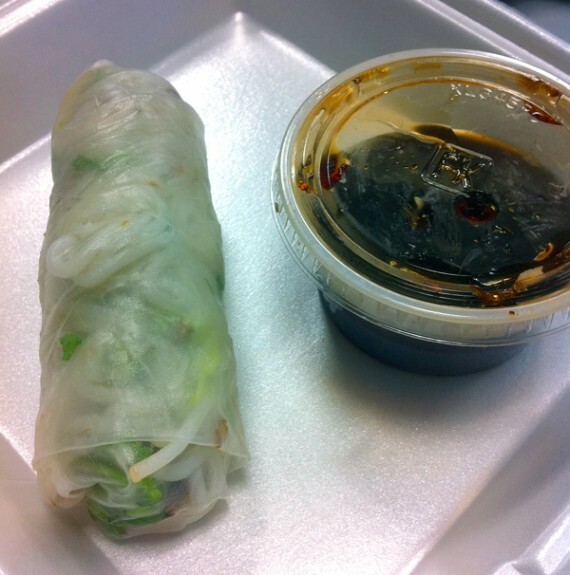 just got word on a new special menu item over at mandoline grill: fresh spring rolls! 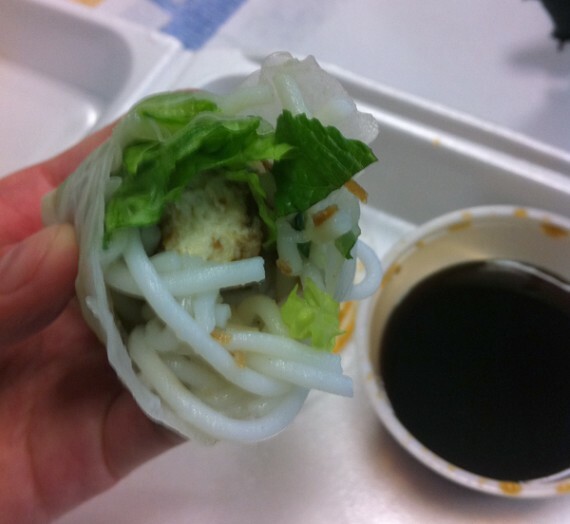 these babies basically have the same ingredients as the noodle bowl: vermicelli noodles, lemongrass tofu, and fresh mint wrapped up in rice paper. right now they’re served with the same vegan sauce that comes with the bowl (a soy sauce-based sauce), but mando is working on a vegan peanut sauce! which means i am going to have to start working out. the rolls are going to be a “special” so they may not be on the menu all of the time, but if you have the chance, TRY THEM! perhaps at vegan beer fest?! oh, and a mando sando update – ask for grilled jalapenos with your banh mi, if you specify vegan they’ll put a piece of foil down on the grill. it really kicks up the heat!! happy birthday, hugo’s! amazing new vegan specials! september is a great month by any measure. fall (the best season ever) is upon us; it’s cooling down outside, and pretty leaves are starting to fall off the trees. the crazy summer is fading away, yet the cozy holidays are ahead. this september is particularly awesome though, because it marks the 30th birthday of hugo’s, one of our favorite restaurants. and to commemorate this occasion, they are offering a very unique specials menu which celebrates the food of the past, while looking forward to the food of the future. meaning: there are tons of old school, meat/dairy-heavy dishes, but EVERY ONE THIS MONTH CAN BE VEGANIZED! partaaaaaay! yesterday i was fortunate enough to try out 7 (yes, SEVEN) of these 10 brand new specials craftily created by chef nabor, and all i can say is…i know i will be a regular customer at hugo’s this month. these dishes need to be eaten several more times, by me, before october comes and they are no longer available. 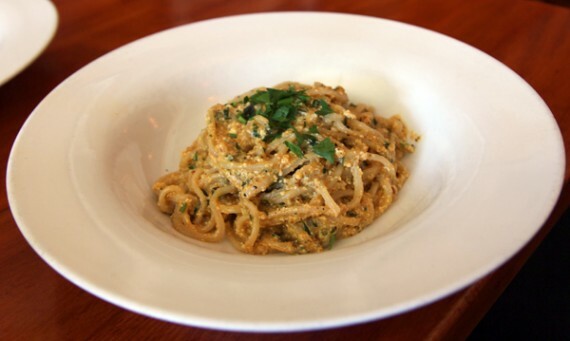 first up i tried the vegan pasta carbonara, an animal-free version of a hugo’s classic. 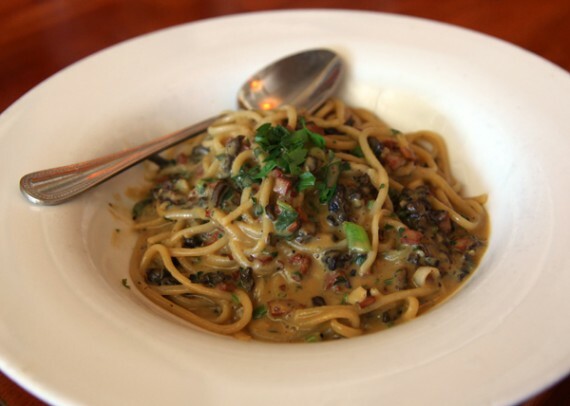 the original comes with prosciutto, bacon, and parmesan cheese—while the new version is loaded with veggie bacon, house-dried smoked mushrooms and a vegan sauce made from sunflower seeds. my oh my, this dish blew me away. chef nabor’s secret recipe of homemade pasta, topped with all the goodness of meaty mushrooms, scallions, parsley and chili flakes was almost too much to handle. 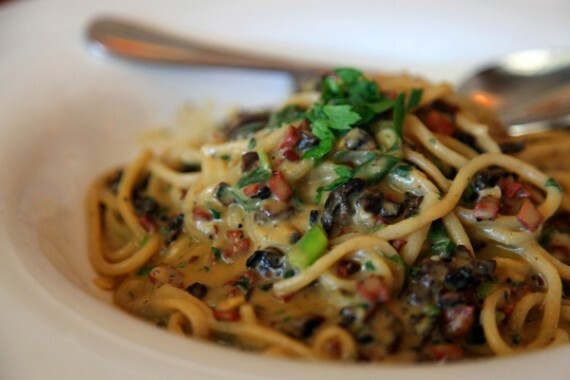 anyone who craves a hearty, creamy meal would be pleased by the vegan carbonara. 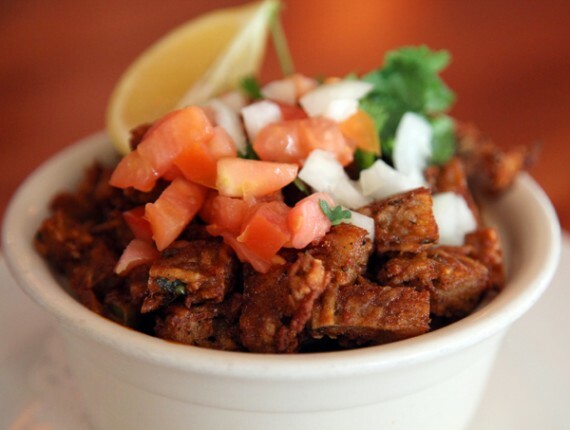 i’m so thankful that hugo’s decided put a cruelty-free spin on this favorite dish. BTW the mushrooms are what make it; they are pure magic, i tell you! next up, i tried a veganized version of the “caprese potato pancake sandwich,” which came with sliced tofu rather than cheese. 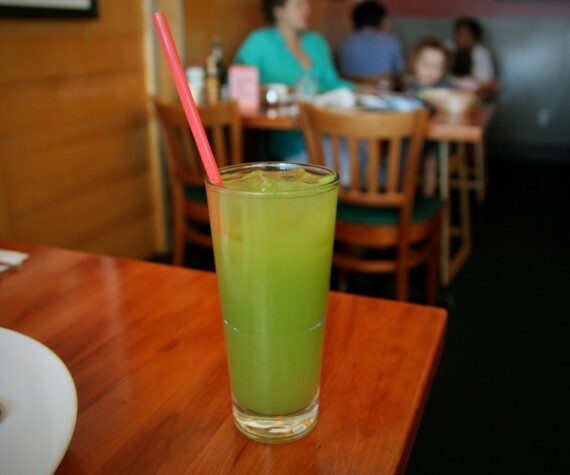 by this time i was working up quite the thirst, so i quenched it with the september special basil ginger lemonade. it was like sweet summertime in a glass, with hints of lemon, basil, and spicy ginger. extra refreshing and packed with a punch, this was one tasty beverage. this meal by default comes sprinkled with real cheese but with one quick request to your waiter, you can get it daiya-style. 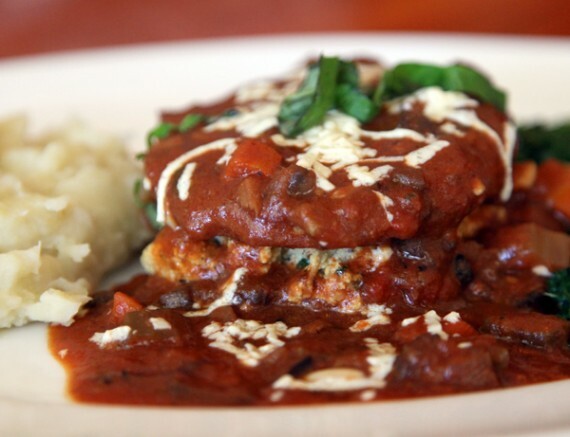 it tastes like a very traditional scrumptious italian dish—layers and layers of rich, deep fried breaded eggplant atop eerily convincing tofu ricotta. it’s got the most amazing and luscious vegetable bolognese sauce as well; why anyone would get this almost entirely vegan dish with a dab of real cheese escapes me! the daiya tastes incredible, so be sure to specify vegan. 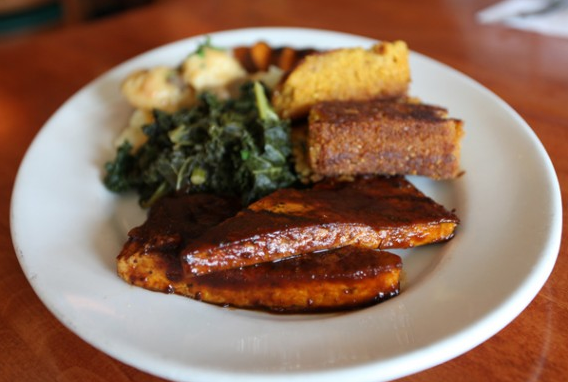 it also comes with a side of hugo’s signature dairy-free mashed potatoes and sauteed leafy greens. perfection! 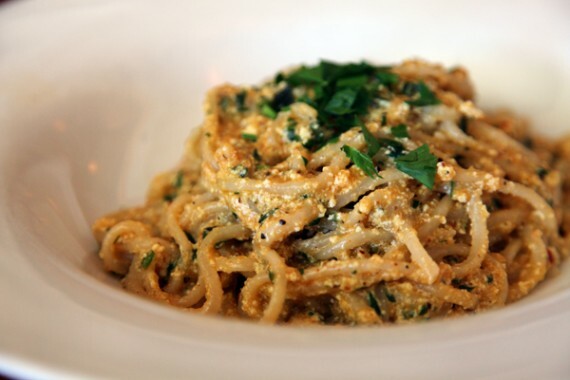 the normal pasta mama is served on hugo’s a la carte breakfast menu, and features a mix of fresh pasta, scrambled eggs, garlic, parsley, and parmesan cheese. this new age version is even better, and comes with scrambled tofu, bread crumbs, and the same delicious herbs and spices. the soft crumbly tofu really does taste eggy (in a non-nasty way), and i was eating this stuff up like crazy. so, so, SOOOOOOOO good. this only re-affirms my belief that hugo’s can successfully veganize ANYTHING, and their best work is always on the specials menu…so be sure to order from that whenever possible. just as i was reaching a maximum fullness, i was offered a chance to try this month’s “trio of sweet delights”. after all the amazing tastes i described above, i just couldn’t say no. within seconds, chef nabor appeared at my table with an gourmet style dessert platter that was nothing short of stunning. the trio of sweet delights was all kinds of fancy. 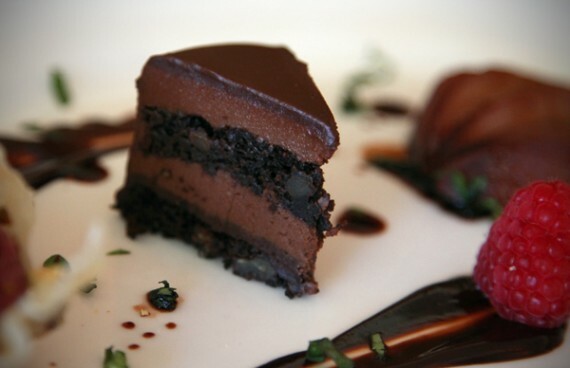 this is the type of dessert i’d expect to see on an upper class tasting menu. 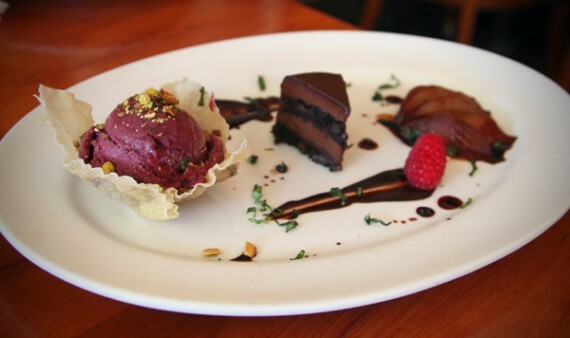 i mean—torte setteveli, poached pear in port, and sorbet in a crispy rice paper–come on! (beware, you must specify you want this vegan, otherwise the sorbet component will contain animal products.) the best of the 3 desserts, OF COURSE, was the torte. we are talking a homemade mini slice of cake filled with chocolate, topped with hazelnut frosting and frangelico liqueur. i die! hugo’s has really outdone themselves this month with the specials, and i am so happy that every single one can be veganized. be sure to get over to the restaurant this september and check them out! 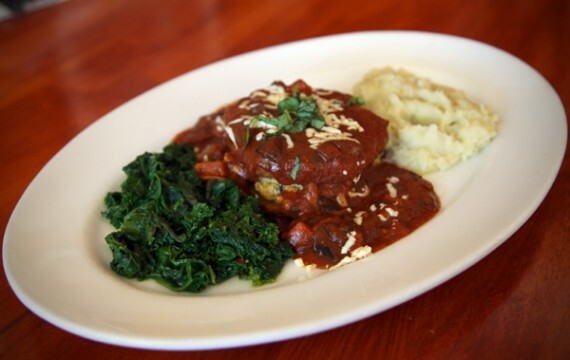 vegan july specials at hugo’s restaurant! it’s a brand new month, which means a brand new specials menu at hugo’s restaurant! july specials start today at the studio city location, and tomorrow in west hollywood…and let me tell you, vegans are in for a real treat with this month’s offerings.